The November Safety Patrolers of the Month are pictured left to right starting in the back) Jalyen Gaddis and Ana Gibson from Charles H Huber Elementary, Dylan Day and Alexis Finke from Wright Brothers Elementary, Ella Joseph and Wesley Carr from Monticello Elementary, Rico McCarthy, Serenity Osgood, Ellie McElroy, and Madison Wynkoop from Rushmore Elementary, Kayla Anderson from Valley Forge Elementary, with officer Nick Lambert Huber Heights Police Officer. 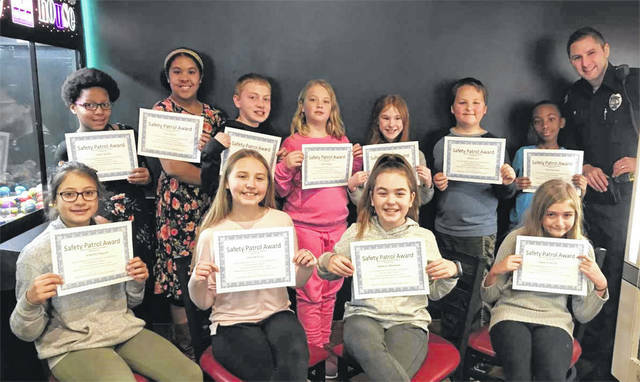 HUBER HEIGHTS — The Huber Heights Police Division wanted to recognize the Safety Patrol students for their hard work and determination in keeping students and citizens safe. The Huber Heights Police Division treats Safety Patrol students from each elementary school in Huber Heights to CiCi’s Pizza as part of a Safety Patrol of the Month Luncheon. The Safety Patrol Advisors from each elementary school nominate their best students for this each month. The Huber Heights Police give the students certificates, lunch with Police Officers, and prizes.